September has been generous on awesome games this year, and educational category was no exception. 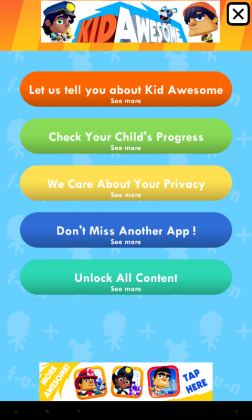 I always keep an eye open for kids games and apps because my girlfriend and I have younger siblings and nephews, some as young as 5 years of age, and this time I would like to introduce this new, yet undiscovered app for preschoolers. This particular app combines one year program for preschoolers on math and English. It’s a pretty heavy 60M download, and the space and RAM oblige, but it’s well worth a purchase. 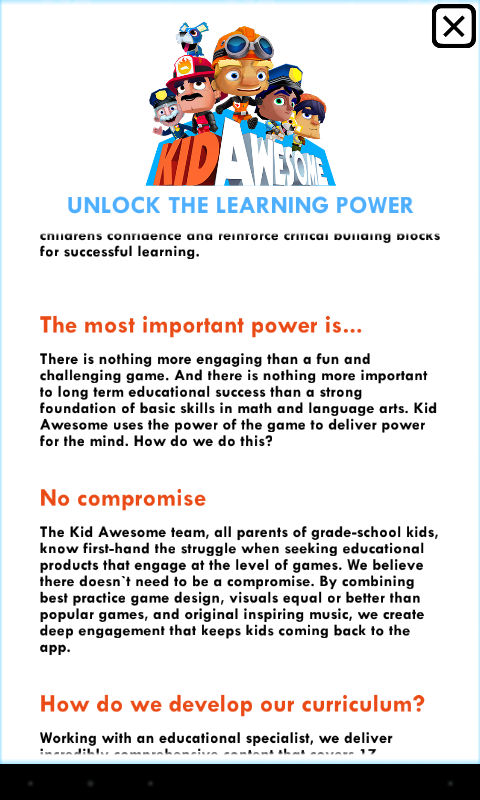 On the surface, Awesome K Math feels and plays like an endless runner, but with all the perks kids love – characters customization, pet dogs, fireman’s hat and boots, colorful visuals and inconspicuous educational elements that feel like a game – studying done right, in other words. What impressed me about Awesome Kindergarten was the UI for both parents and kids. 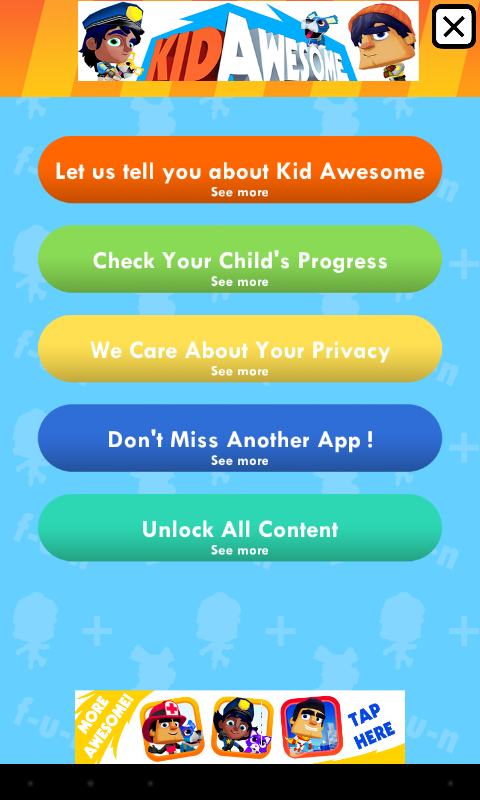 Parents have their own space within the game’s UI where they can keep an eye on their children’s progress, see what topics they’ve covered, and have an option to unlock all levels at once, even though the game does not recommend it. If your kid has access to all the levels at once, he or she might jump into more difficult things, fail and lose interest. 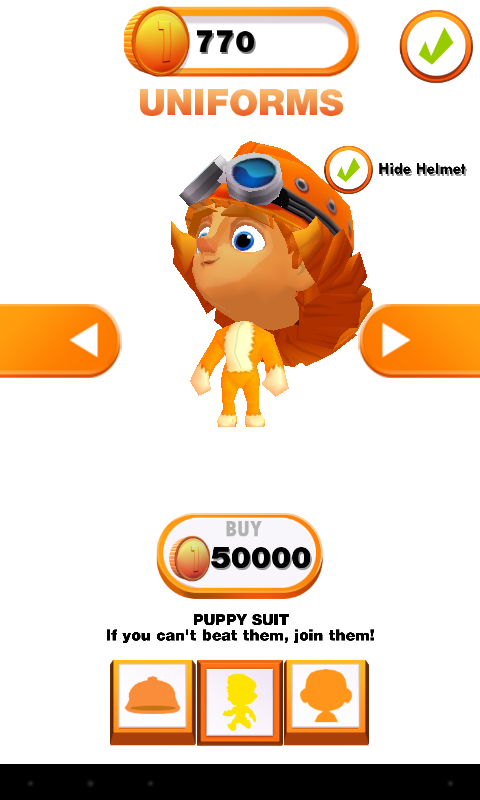 Your kids start by customizing the character. They can choose the looks, hair and skin color, clothes, nifty elements like boots and hats. The premise goes like this – a kid is on a rescue mission, saving puppies. The protagonist then dashes on an endless run across the colorful city, collecting puppies in exchange for correct answers. I haven’t advanced deeply yet, so the initial levels contain basic tasks like comparing items and identifying which is heavier, or lighter – a teddy bear or a house? Or, how many apples on a picture depicting apples and oranges. No problem if your kid does not read, yet, because the protagonist has an elderly instructor, or rather operator, who voices all the tasks. All you kid then has to do is swipe left or right to change lanes of the road because the answers are placed across the lanes, and the player has to choose the correct answer. 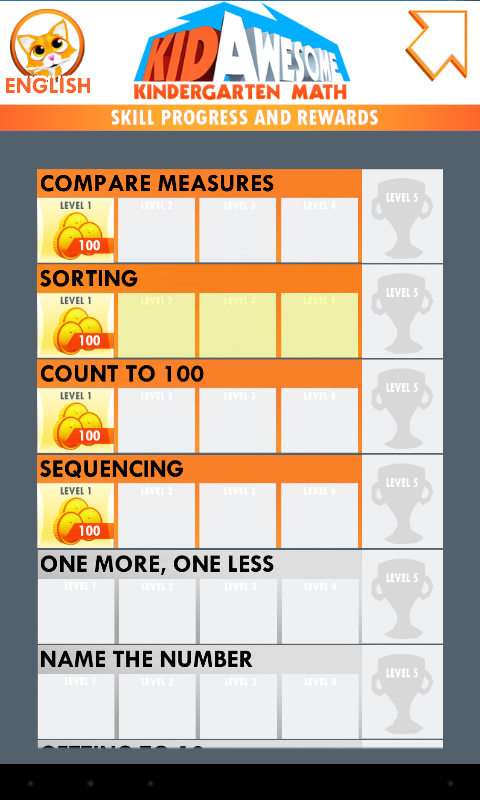 In between the levels, the young player can solve quick challenges that consist of three questions, and when answered right, a new perk is introduced – a character, or an item. In the English section, the runner has to save kittens. 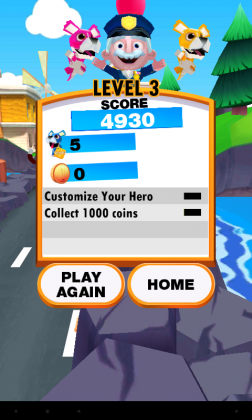 The introductory levels start with phonics, letters and words, upper and lower case, sight words, sounds of the alphabet, rhymes, pronunciation, up to vowels and words, and the player has to switch lanes as the operator voices the task and the upcoming answers. The operator only voices the answer that approaches on the current lane, so in order to hear more options you’ll have to switch lanes. Both Match and English sections have maps where you can see how far you’ve advanced; a character customization section, where you can change clothes, appearance and apparel of the runner; and play options. Before each level, the game offers to build a boost pack by playing a mini-game, which consists of three questions, properly voiced and accompanied with graphic instructions. If answered correctly, the game rewards the runner with a power-up, like a magnet, or a speed booster. The controls are the only pain here – swiping to change a lane does not always register. This causes the hero bump into obstacles, which effectively brings the runner to an end. I just missed three correct answers in a row because the swipe did not get registered. Needless to say, younger players get frustrated when failing though no fault of theirs. Awesome Kindergarten is a visual treat to kids, and looks like a cartoon, with pets and houses, and interesting challenges wrapped in a healthy dose of colorful graphics. Add the excellent voiceover, themed sound track and the game becomes more like an interactive, educational cartoon, especially since the player gets to save cute pets. I don’t see any in-app purchases here, which is great for a paid app. 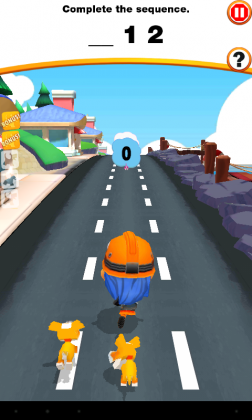 There are some areas that may encourage the young player to spend the in-game currency, coins collected by running, on clothes and looks of the runners. When the player has insufficient coins, the game suggests he or she goes and plays some more to collect enough coins. Sounds fair to me, but conveniently, the swipes stop getting registered when the challenges are over and you can run for coins, so you don’t collect much. A bug in controls, where swipes don’t register occasionally hinders the gameplay and causes failure. I would stress occasionally, not every time, though. Awesome Kindergarten Math and English is a superb educational game for kids. In its core, it is an endless runner properly spiced with math and English quizzes, and tons of kids-oriented content. The game is available for iOS and Android platforms, and will set you back $2.99. It’s a definitely worthwhile purchase, but we would suggest the developers address the controls issue. We’ll be happy to rate it five stars when the fluctuating bug in controls is ironed out. Awesome Kindergarten Math and English is a superb educational game for kids. 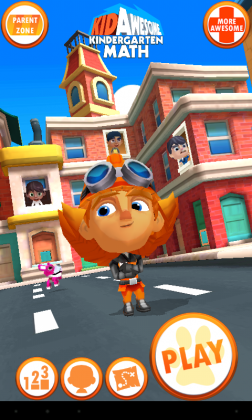 In its core, it is an endless runner properly spiced with math and English quizzes, and tons of kids-oriented content.